Xinwen CHEN, PhD,, Professor. 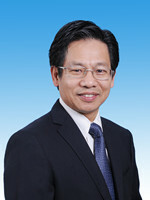 He obtained his BSc and MSc from the Department of Biology, Central China Normal University in 1986 and Henan University of Technology in 1988, respectively. In 1998, he obtained his PhD from Wageningen University in 2001. He subsequently worked at the University of California at Berkeley and Wageningen University as a visiting scientist. Dr. Chen is one of the scientists in “Hundred-talent Project” CAS and one of the awardees of the "National Outstanding Youth Fund". Dr. Chen’s current positions include Director General of WIV, a member of the institute’s Academic Committee, a member of the institute's Academic Degree Committee. In addition, Dr. Chen is Editor- in-Chef of Virologica Sinica, a member of the Council of the Hubei Society of Microbiology and a member of the Council of the Hubei Society of Biotechnology. Dr. Chen as the chief scientists assume "national major scientific research projects", and also assume multiple projects such as 973, the national natural science foundation and institute project. Dr. Chen has more than 130 publications, of which more than 70 are registered in the SCI index. He was also awarded second prize in the "National Innovation Award" in 2005, awarded first prize in the "Natural Science of Hubei Province" in 2011.